I have made a simple scene. I have put three objects with some distance between each other. Press Ctrl-C to create a camera in the perspective view. With the teapot selected, do a right click and select Object Properties. It opens the Object Properties window. Set the Object ID value as 1. Following the same way, set the Object ID value of the cylinder as 2. Following the same way, set the Object ID value of the box as 3. Press Shift-Q or F9 key to render the scene. Click on Save Image icon. It opens the Save Image window. Set the file name as Diffuse and select the file format as RPF. Click on Save button. It opens the RPF Image File Format window. Choose 16 Bits per channels option. Turn on all options. Click on OK button. Open After Effects. Import the Diffuse.RPF file in the timeline. You will notice the file has come with all properties like Z-depth, Object ID, Z–coverage etc. With the Diffuse.RPF layer selected, go to Effects > 3D Channel > ID Matte. In ID Matte effect, the default value of ID Selection is set to 0. Set the ID Selection value as 1. You will see that only the teapot is visible. This happens because in 3ds Max, I had set the object id value of the teapot as 1. Make the duplicate layer of Diffuse.RPF layer by pressing Ctrl-D key. This time, set the ID Selection value to 2. The cylinder gets highlighted, because in 3ds Max, I had set the object id of the cylinder as 2. Once again, make the duplicate layer of Diffuse.RPF layer by pressing Ctrl-D key. This time, set the ID Selection value to 3. The box gets highlighted also, because in 3ds Max, I had set the object id of the box as 3. You can give proper name to the layers as Teapot, Cylinder and Box. Bring the diffuse layer once more in the background to get the floor. Now you can control the individual layer. For example, if you want to change the color of the teapot, just select the teapot layer, go to Effect > Color Correction > Hue/Saturation. 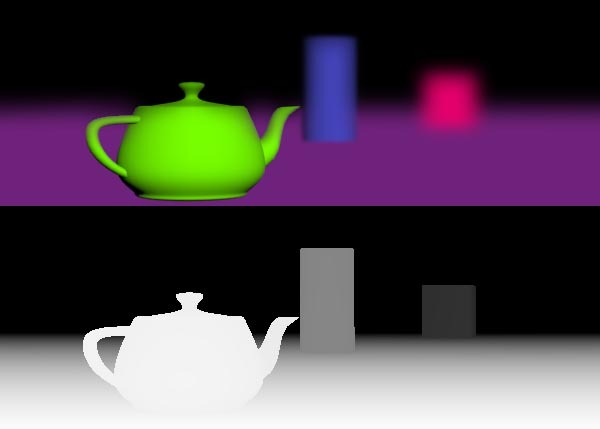 Change the Master Hue value and you will see the color of the teapot changes accordingly. Following the same way, you can apply Glow to the cylinder layer. This way, you can control any layer individually and apply any effect. With the diffuse layer selected, go to Effect > 3D Channel > 3D Channel Extract. With Z Depth channel selected, it looks like as shown in the following image. You can play with the Black and White values to get the perfect Z depth. Just remember that the nearest object to the camera remains in white and as it travels far, it becomes grey. With the layer selected, press Ctrl-Shift-C to pre compose. Rename the pre composed layer as Diffuse.rpfComp 1. Bring the Diffuse layer in the timeline. Turn off the pre composed layer. Apply S_Z Blur effect on the Diffuse layer. Alternatively you can use Camera Lens Blur. It makes the entire layer blurred. Pick the pre composed layer as the Z Buffer channel. Now you get the real depth of field in the image. The front teapot looks in the focus while the cylinder and box look out of focus. In this tutorial, I showed you how to control the individual object in the layer by using just one pass. This is the beauty of RPF file format. It contains almost every channel like Z Depth, Object ID, Material ID, Z Coverage etc and every channel could be controlled by using just one layer. In the next part of the tutorial, I will show you the most useful and powerful file format used in the industry to control everything.